You can create free fields in the event section to customize your System One account. 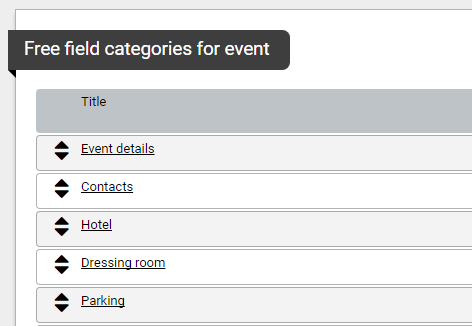 With free fields you can store additional information with your bookings. You can also use this information in your document templates and in the mobile itinerary. Note: only users with access to the System Settings can manage free fields. Navigate to System Settings > Free fields for event. Free fields can be divided into different categories. You can either add a free field to an existing category or create a new category for your free field(s). 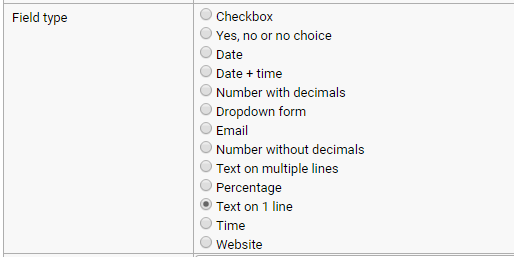 If there is no category created yet, start with creating a category first, before adding a free field. To create a new category select New. Enter a title and select Save. To add a free field, navigate to the category you want to add the field to and select New. Label & Label subscript: enter the name of the field at Label and optional the Label subscript. Reference code: this reference code is used in your document templates. Field type: choose the type of field that you want to create. Default value: here you can choose a default value for the field. This default value is preset when you create a new booking in the calendar. After saving, the field appears in the list with created free fields.